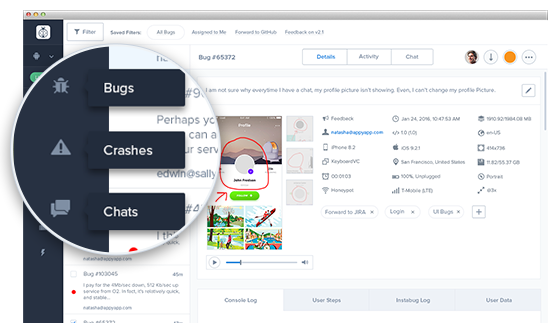 Instabug Updates: Screen Recording, Real-time Chats & More! We’ve added new awesome features! Make sure to head over to your dashboard and try it yourself. Apps use the Instabug SDK throughout various phases of app development, whether it’s for bug reporting, crash reporting, or customer support. Our mission is to provide an unmatched experience for each one on its own. With bug reporting, we’re allowing testers and users to record what happens in-app to make it much easier to trace weird bugs. We’ve also redesigned the SDK to support real-time in-app chats while enhancing the responsiveness of the dashboard. And expect many more updates over the coming months! Without further ado, here are the latest Instabug SDK features. We can’t wait to hear your feedback. They say a picture is worth a thousand words. How about a video? Now your users can attach screen recordings to your bug reports and you’ll be able to watch the app screen as the bug happens. This will make it much easier to report weird animation bugs or odd repro-steps. Users will now have more reasons to love you with the new “Talk to us” button that lets you chat in real time and provide the best support experience you can offer them. There will be no more waiting or refreshing pages as you will receive everything as it happens. We’ve split issues into Bugs, Crashes, and Chats to make it easier for you and your team to go through each tab independently and focus on what matters. Instead of viewing all issues in one place, developers can work on bugs and crashes, while the support team can work on chats with your users. We’re now fully supporting cross-platform SDKs like Cordova, Xamarin, and React Native so that you can integrate Instabug with whatever platform you’re using. We just announced more integrations with Atlassian. We currently support Jira, HipChat, Jira Service Desk, and Bitbucket so you can forward all issues from Instabug directly to your Atlassian tool.